I do love me a coffee cake. Mid-morning, they're just about the best thing that can happen. These here are like eleven o'clock desk treats of happiness. Perfect if you need a pick me up (or if you don't; we want cake and we want it now). Because they contain no lactose, they're also deliciously light and perfect for anyone avoiding dairy. Creamed coconut is super useful for dairy free cakes; you can find it in rectangular cardboard packets usually in the world food aisle of most supermarkets. Warm the almond milk in the microwave or on the hob. Break the creamed coconut up into a bowl and pour over the almond milk, stirring until it has reached a creamy consistency. If using espresso powder, make up with 50ml of hot water into strong coffee. Stir into the mixture. Add the coffee and stir until the sugar reaches a thin paste. 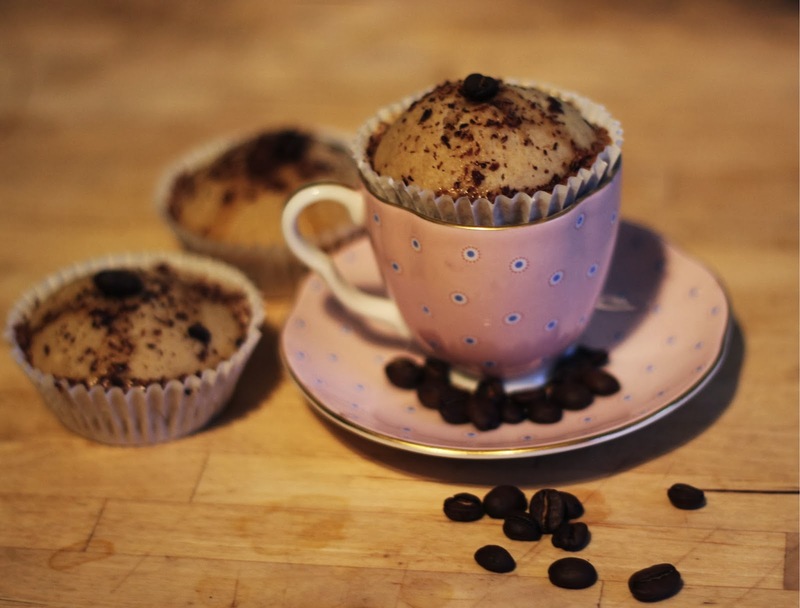 Spoon over the cooled cakes, and decorate with some grated dark chocolate and coffee beans. They sound yum. I'm trying to avoid dairy atm, so these might be a godsend. Does the coconut cream add much flavour?